Are ICT innovations Changing information Seeking Behaviour? Introduction; The rise of the information society; The internet era; Google generation: what is the evidence? Emergence of new forms of knowledge production, search and acquisition; The emergence of digital scholarship; What next? 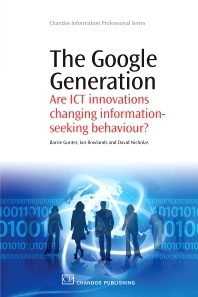 The Google Generation examines original and secondary research evidence from international sources to determine whether there is a younger generation of learners who are adopting different styles of information search behaviour from older generations as a function of their patterns of use of online technologies. The book addresses the questions: might the widespread availability and use of search engines, such as Google, give rise to a different type of scholar who seeks out and utilises online information sources and thereby develops a different orientation to learning from older generations whose information seeking practices became established initially in the offline world. Barrie Gunter is Professor of Mass Communication and Head of the Department of Media and Communication, University of Leicester. He was formerly Professor of Journalism Studies at the University of Sheffield and previously worked in the broadcasting sector. He has published 47 books and over 250 book chapters, journal articles and other reports on a range of media, marketing and psychology topics. Among his current interests are the adoption and use of internet and digital TV applications. Ian Rowlands is a Reader in Scholarly Communication at the School of Library, Archive and Information Studies at UCL and an active member of the Centre for Publishing and CIBER. David Nicholas is Professor of Information Studies and the Director of the School of Library, Archive and Information Studies at UCL. He is also the Director of the UCL Centre for Publishing and a Director of the CIBER research group.